La Plata dolphins are one of the smallest dolphins worldwide. In fact, they could easily hold the title for “world’s smallest dolphin” just that a few individuals vary in size. Another major distinguishing feature of this intriguing creature is its exceptionally long beak. The La Plata dolphin has the longest beak relative to its body size of any cetacean. Their bodies are a gray/brown shade with a lighter colored underside. But juveniles are browner than adults and typically have seven strands of hairs on their upper jaw. Unlike most other dolphins, these ones are somewhat solitary and generally avoid boats and humans. They are also not prone to acrobatic displays at sea like the bottlenose dolphins. Rather, they lie quietly under the water surface with just their long beaks peeking out of the water surface. As a result, they are a bit hard to spot. The IUCN lists this cetacean as a Vulnerable species. Females of this species tend to grow faster than males. So, adult females can grow up to around 1.8 meters (6 feet) long and males 1.6 meters (5.3 feet). Averagely just 50 kg (110 lbs). It is not common to spot these dolphins and their movements are slow and quiet. 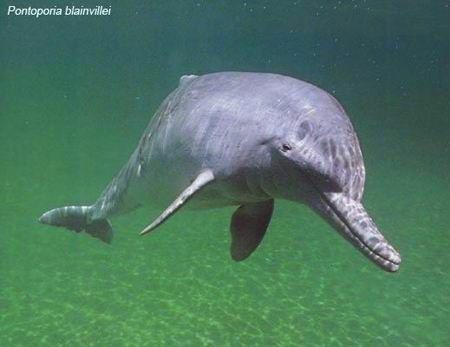 Like other river dolphins, the La Plata dolphin suffers the effects of reckless human activities that result in habitat destruction and water pollution. Several specimens of these dolphins have been found with plastic debris and synthetic material clogging their stomachs. This dolphin is harmless to humans. 90 percent of La Plata dolphin population in Guanabara Bay, Rio de Janeiro was lost in just three decades due to adverse human activities in their vicinity. Yet another trait distinguishes La Platas from other dolphins is that researchers believe it is monogamous and sticks to one mating partner. They also reach sexual maturity at a relatively young age. Hence, females can breed successfully from age three and males from age two! However, these ages may vary slightly depending on geographical location. Mating season lasts from January and February every year with females producing just one calf. The calves spend a lot of time with their mothers learning to survive and feeding on milk till they are weaned at between 8 and 9 months. La Plata dolphins are bottom feeders that hunt on the river or sea floor. They can be seen hunting in groups and they feed on up 24 different types of fish and octopus, squid and shrimp. Natural predators of this dolphin include the killer whale (orca) and different species of sharks. Of all the threats to this animal, the most alarming is the increasing incidents of bycatch and death in gillnets. At least 500 to 800 of these dolphins die this way every year. Scientists from Brazil, Uruguay, and Argentina are calling for international assistance to save these dolphins as they are most affected in these three countries. The IUCN lists the La Plata Dolphin as a Vulnerable species. Most threats to the La Plata dolphin are directly related to human activities and almost 1,000 of these dolphins die every year unnecessarily as a result. The La Plata dolphin is unique in the sense that it has its own genus and family, the Pontoporiidae. Researchers Paul Gervais and Alcide d’Orbigny first named it back in 1844. The La Plata dolphin is endemic in the coastal Atlantic waters of the southeastern tip of the South American continent. You can find it in places like the Río de la Plata estuary, near Ubatuba (also in Brazil), Uruguay, and parts of Argentina.